To earn this credential a practitioner must be licensed to practice in their state or local province. Their license must be in good standing. The practioner must complete at least 21 hours of FACES instruction which includes a review of pertinent anatomy, physiology and a neurobiology. 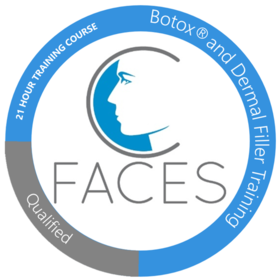 The recipient must take part in the cadaver review workshop, demonstrate proficiency in diagnosis and treatment planning for facial applications of neurotoxins and soft tissue fillers, complete the written self-assessment test and finally, engage in the hands-on live-patient training session. Yes, make FACES a Trusted Issuer. This will automatically accept all pending and future Credit from FACES. By removing trust, badges created by FACES are no longer automatically accepted and you'll need to review in your inbox before accepting.